The Little Knights Child Care Center allows your child to develop physically, emotionally, socially and cognitively in a safe and nurturing environment. Children will participate in various activities including art, dress-up and large/small motor skill development. The Little Knights Child Care Center is flexible, and children have the option of napping each day – but it is not required. 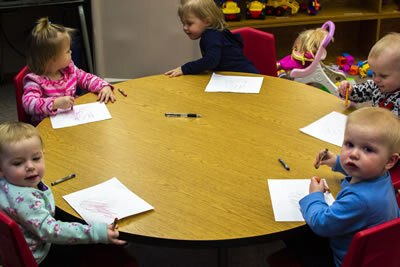 Little Knights Child Care Center is a small community of qualified individuals learning and working together in a safe and healthy environment. Through both structured and free-time activities, the children’s social, emotional, physical and cognitive development will continue to grow.The environment nurtures and accommodates the needs of children on an individual and group basis, providing a solid foundation for children to build upon.